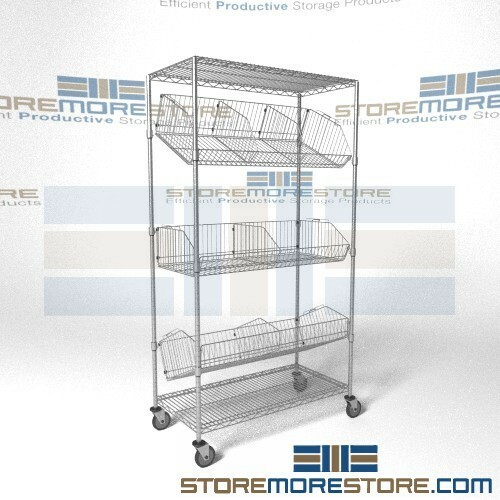 These new angled shelf carts with adjustable wire baskets are perfect for storage, supply transport, or display. The wire construction also allows for high visibility so you can take inventory quickly as well as air circulation for stored items, which prevents dust build-up and makes spills easy to clean. The shelves can be positioned flat or can be angled up or down to improve the flow of materials, provide a pleasing display, or allow easy access to top or lower levels. 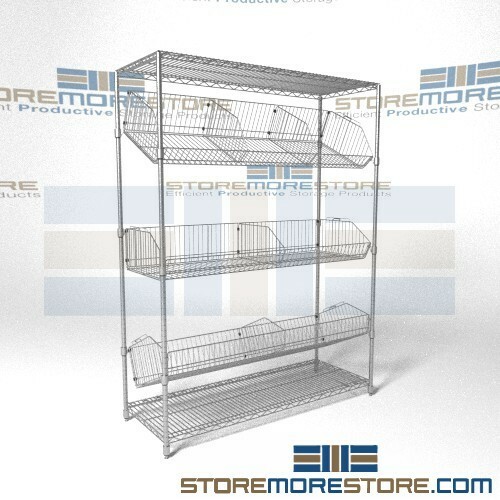 Use them for storing hospital supplies, stock rotation, retail displays, warehouse inventory picking, storing items that are difficult to keep on flat shelves, or anything else you can think of. Part of what makes these angled shelf carts so desirable are the shelves that can easily be added or removed and adjusted on 1″ increments. They don’t have to be carts, either; the angled shelves are also available as stationary racks. Adjustable wire dividers are also available to create separated storage without having to buy plastic bins. Casters make transfer and exchange applications for inventory rotations fast and easy, while stationary racks provide a durable and aesthetically pleasing solution for warehouse picking or even merchandise display. Angled cart shelves are available to buy online with multiple configurations available. If you need any assistance or just want some help choosing which configuration is right for you, please call us at 1-855-786-7667.